Today is Ellen’s stop on the blog tour for When The Waters Recede by Graham Smith and I’ll be sharing her review with you all! I’ll kick this review off by saying that in my opinion this is the best DI Harry Evans Major Crimes Team book yet!! An absolute crime lovers delight from beginning to end. I have read all the full length stories and novellas in this series but this blows the others out of the (flood)water. The book opens with a car being pulled from raging flood waters; in the driver’s seat is a dead man and in the boot the decapitated body of a woman and the Major Crimes Team are handed the investigation. The woman is soon recognised as a local ne’er-do-well, but the man cannot be identified and this leads the team and their former leader, Harry Evans, into the dark underworld of the Cumbrian crime scene. They soon end up investigating protection scams which in turn lead them into things they never expected. I love the way that we have got to know the Major Crimes Team as the books and novellas have progressed. Each seems to reveal a little bit more about each member of the team and this time it was Lauren’s time to shine. Now, I reckon she’s a total love/hate character. You’re either gonna love the way she uses her feminine wiles to gain the information she requires or she’ll rub you up the wrong way and you’ll want to poke her eyes out. In When the Waters Recede we are presented with a troubled and changed Lauren. Gone is the confident, cocksure woman she was and her vulnerable side is exposed; I couldn’t help but feel for her. Luckily Harry has got her back as always. Harry Evans is the loveable rogue that you can’t help but admire. Yes, he doesn’t always do things by the book but he gets the job done. There is still a power struggle between himself and his replacement DI Campbell. Harry really struggles to relinquish his control at times but just about manages to toe the line he needs to keep the fragile peace of their arrangement. It was interesting to see a possible love interest on the horizon and I would love for Harry to finally have some closure on the tragic loss of his wife and baby. Saying this, I have come to expect the unexpected with Graham Smith’s books though so won’t be holding my breath! Today I’m thrilled to be taking part in the blog tour for Past Echoes, the latest in the Jake Boulder series, by Graham Smith. I’ll be sharing my review with you all for this one a little further down, but first, the all-important bookish information! As you should know by now, I am a big fan of action thrillers. You know the type of ones I mean; cinematic, fast paced and full of stuff going on! Graham Smith’s Jake Boulder series is a prime example of these. I have said this before, but it bears repeating. Boulder can stand up there with Lee Child’s Jack Reacher in terms of addictive-ness and the quality of the plots and writing. I will happily follow Boulder the same way I follow Reacher for as long as Graham keeps writing this series. I am a Boulder fan for life! Following on from the events of The Kindred Killers, Boulder is back in Past Echoes, doing what he does best. In this one, he has to track down a man who is the benefactor of a small fortune, but he also has to become whistleblower for a forty year old secret. Lets be honest here, it sounds a bit like trouble is a-comin’ for Jake! Not least because this secret caused a young woman to flee New York forty years ago. Alongside all of this, Jake’s half-brother is also very ill, and needs a bone marrow transplant. Nobody is a match, except maybe one person, Jake’s estranged dad, Cameron MacDonald. Jake vows to find him to see if he is a match, and make him do one decent thing in his life for his kids. There is quite a bit going on in Past Echoes, with the various plots in the narrative. But not once did I find myself lost, or struggling to keep up with the pace of the book. I loved how the momentum started at the beginning, and did not let up until the very end! The characters are excellent as always, there are plenty of twists and turns in the plot and the action is just top notch. I am waiting patiently for the next book in the series now, and each one after that. And soon still isn’t soon enough, haha! Past Echoes is a tense and thrilling read. Brilliant characters, an intricate narrative and clever denouement made this a top quality read! Today Ellen is taking part in the blog tour for Past Echoes, the latest in the Jake Boulder series, by Graham Smith. I’ll be sharing her review with you all for this one a little further down, but first, the all-important bookish information! 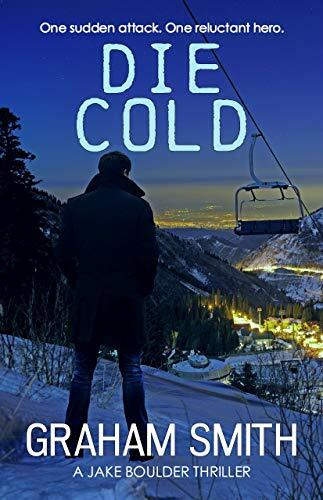 I’m a fully paid up member of the Jake Boulder fan club so was delighted to have the opportunity to read and review the third novel in this series. In Past Echoes Jake is tasked with solving a mystery that Ms Rosenberg (the brash but likeable journalist from the previous books) has left for him to solve and to find his estranged father Cameron to “persuade” him to be a donor for his half-brother John. The tagline for this novel could easily be “This time it’s personal” because as events snowball Jake is taken on a heart breaking journey. A journey which results in some of the bloodiest fights we have witnessed in the previous books. The events in Past Echoes change Jake Boulder into a different man and I definitely wouldn’t want to be on the wrong side of him! As with Watching The Bodies and The Kindred Killers we are given a little bit more of an insight into Jake’s past and can see how these events have shaped him. In being introduced to his father Cameron I could definitely recognise similar traits in Jake but thankfully the tough love of his mother seems to have rounded off the harsher edges of this likeness. Featuring political corruption, the New York underworld, family drama and a chilling hitman called The Mortician, Past Echoes is the most nerve-racking book that I have read in a long time. I’m interested to see what is next from Jake Boulder and if he can ever get over the life changing events he has been put through. Graham Smith has a talent for writing characters that are so personable and I do wonder if my emotions can handle much more! A fantastic addition to the Jake Boulder series; five stars from me.